Thanks to Denis Grey, I now have comprehensive stats for player numbers in the UK DBA circuit to add to those for other rulesets. Looking at attendance across the 15 or so annual tournaments in the UK, participation in DBA has been steadily rising over the past 3 years and looks set to carry on that upward trend into 2018 (if numbers at the first 2 events of the year are anything to go by). 86 people in total have played at least one DBA event in the last 3 years. 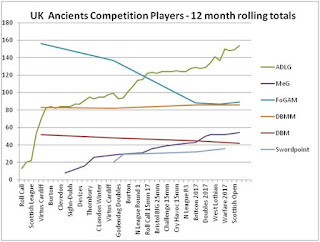 Adding these more accurate numbers into the mix gives the following popularity table for numbers of people entering at least one UK ancients competitions during 2017. 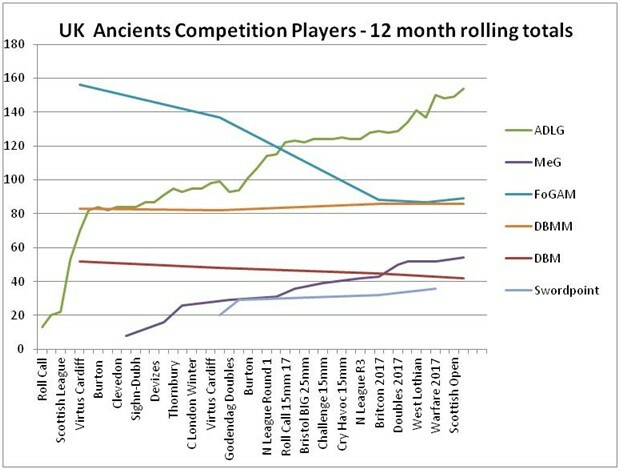 One interesting thing to consider from these numbers is the popularity of "DBx"-based, "one base = one unit" format games - almost exactly 2/3 of all UK competition ancients players are playing systems in which one stand = a unit. Barkers legacy is still going strong! 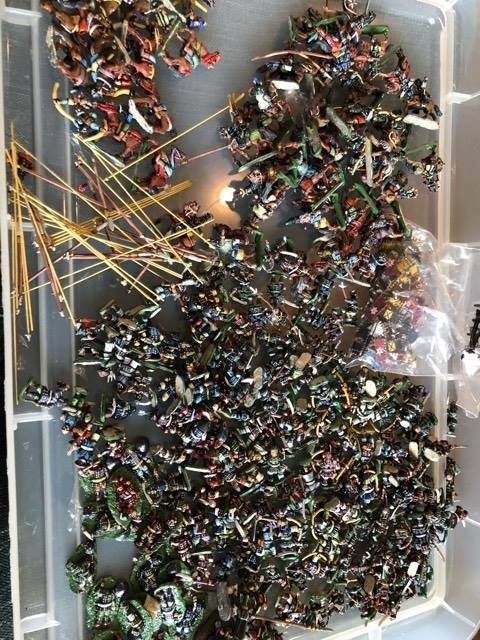 I'm sure there must be some 6th and 7th edition numbers out there too, and maybe also Armati or War & Conquest ? (ADLG and DBMM include 2 events where 15mm and 25mm were offered in parallel, with FoG numbers including 1 such event. This tends to depress the average entry size a tad). This shows the last few years and illustrates how player numbers have changed - each line represents a different ruleset, and each point on the graph represents the total number of players who've taken part in at least 1 event for that ruleset in the previous 12 months. 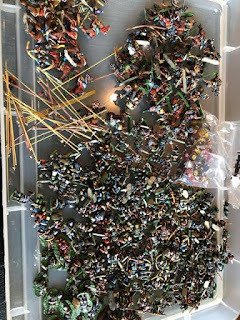 The data is a little "gappy" for some of the sets, but for both ADLG and MeG I believe every event held in the UK since June 2015 has been captured.